With a new Apple media streamer reportedly weeks away, we asked app makers what’s worked for competing platforms like Roku and Chromecast. Apple has a lot of catching up to do if it’s going to launch a new Apple TV in September. Apple’s current streaming set-top box dates back to 2013, and even that was just a minor update from the previous year’s model. The software has also stayed largely the same—with the exception of an iOS 7-like visual refresh last year—and while the app selection has grown, there’s still no proper app store to rival those of Roku, Amazon’s Fire TV, and Google’s Android TV. No one feels the pain of this quite so much as app makers, who would love to feature their software and services on a modern Apple media-streaming box. So rather than coming up with my own wish list for the next Apple TV, I reached out to some of these developers to hear what a brand-new Apple TV box could do to stand out. Apple currently offers about 60 third-party apps for Apple TV, and all of them are on a tight leash. Every app must fit into a strict template, defined by its top navigation bar and text-heavy lists atop a featureless black background. If Apple opens its platform to more apps, as expected, several developers I spoke with hope they won’t be stuck with those rigid templates. Nuvyyo, for instance, has created a custom Roku app for its Tablo broadcast DVR hardware, letting users find and record shows through a grid-like channel guide. That same system couldn’t exist in Apple TV’s current format, says Steve Brambilla, Nuvyyo’s director of client engineering. Apple’s current templates do have one advantage: They create consistency, so users don’t feel lost as they move between apps. But that’s something Apple could solve with strong developer guidelines, says Scott Olechowski, cofounder and chief product officer for media server software Plex. With Android TV, for instance, Plex tries to follow Google’s guidelines as best it can, even though it is free to diverge from them. “If people actually adhere to those, I think you can get apps that behave fairly similarly, even if they don’t look identical.” Olechowski says. An influx of new Apple TV apps would also complicate the process of figuring out what-to-watch problem that other platforms have experienced while allowing more developers into their app stores. One likely solution from Apple will involve universal search, which is already headed to the iPhone and iPad with iOS 9. By letting app makers index their contents to appear in Siri and Spotlight searches, users could just ask for the name of an actor or TV show, and get results from individual apps. Rumors have suggested that Apple TV might include this feature as well, which makes sense given that every other major set-top box now has some kind of universal search built in. Beyond just the typical searches for cast, crew, and titles, Tablo’s Brambilla hopes Apple will support more advanced searches, letting users ask for the next episode of a show they like, or popular shows from a certain time period or genre. Other media streamers have also been trying to pull content out of individual apps and into the main menu system. Roku, for instance, has a section called “My Feed,” where users can track unreleased movies and get notified when they’re available in an app. 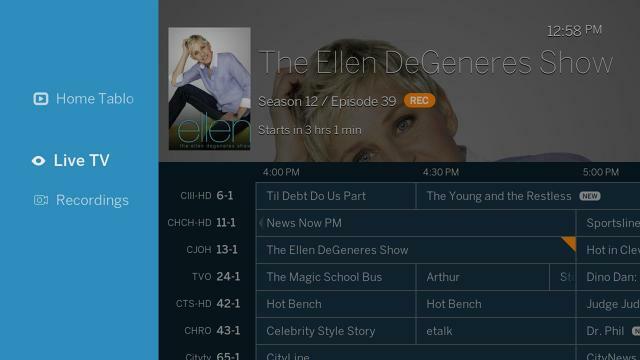 Amazon’s Fire TV interface places even less emphasis on apps, and more on video from Amazon Prime and other sources. 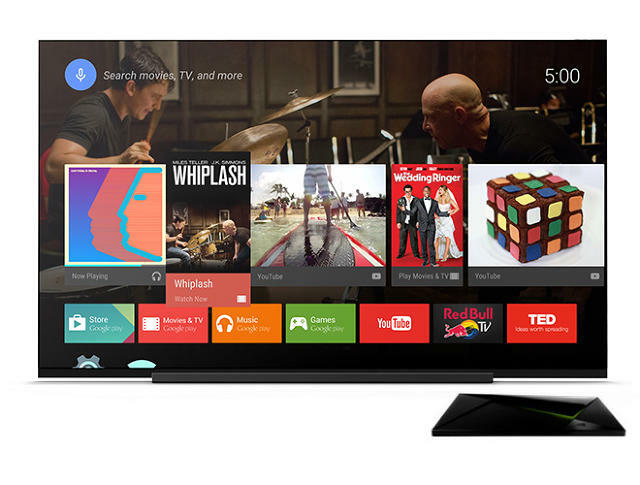 Android TV offers a “Recommendations” bar on the top of its main menu, which third-party apps can feed into. AirPlay used to be Apple TV’s killer feature. By letting iPhone and iPad users beam nearly any video or audio to the big screen, AirPlay served as a crutch for Apple TV’s limited app selection, and was often faster than using a regular remote control. With Chromecast, there are a lot more capabilities there that are just unavailable with AirPlay. But a couple years ago, Google devised a better system with its $35 Chromecast dongle: Instead of beaming video directly from the phone or tablet, Chromecast receives a set of instructions so it can stream that content directly from the Internet itself. This frees up a phone or tablet do other things, like browse the current app, make a phone call, or leave the house without disrupting the video. Chromecast also allows for volume controls from the phone or tablet, and lets others take control of the current stream with their own devices. “With Chromecast, there are a lot more capabilities there that are just unavailable with AirPlay,” says Albert Reinhardt, vice president of product for the indie streaming video service Fandor. Plex’s Olechowski also praises Chromecast’s ability to fling TV guide data to the big screen as you’re browsing, which is useful for choosing what to watch with a group. “Being able to open that communication channel allows you to do a lot more in concert with the TV than you can with AirPlay today,” he says. With rumors of an A8 processor inside the next Apple TV, developers are hoping it can handle more than just a new wave of apps. For instance, Apple could bring over the picture-in-picture mode that will debut on iPads in iOS 9, letting users play videos in thumbnail mode on top of other apps. While this is a very old concept for TVs, it’s not a feature you currently find in streaming devices. Plex’s Olechowski is also hoping for a touch pad in the next Apple TV remote, a feature which is rumored, if only as a way to quickly scroll through menu items. No one likes to mash a directional button repeatedly, and Plex users can be quite vocal when existing hardware shortcuts aren’t being utilized. “Sometimes, people are trying to do things, they know what they want to do, and there’s just a speed component to it,” he says. More than any of these feature suggestions, however, developers who aren’t part of the current Apple TV’s exclusive lineup are simply hoping they can get on the platform in the first place. Touchscreens may be extremely versatile and a good fit for mobile devices, but one thing they don’t lend themselves to well is extended typing sessions. As a result, we’ve seen numerous portable keyboards designed to easily fit in a pocket alongside your smartphone. Now LG is getting in on the act with its Rolly Keyboard, which it calls the industry’s first solid rollable wireless portable keyboard. Rollable keyboards are nothing new, so long as they’re made from silicone. While these provide more tactile feedback than an onscreen keyboard, they still can’t hold a candle to the feel of a desktop keyboard. Designs like the Jorno and Thanko’s offering have attempted to effectively put a solid desktop keyboard in your pocket using different origami-like approaches. Now LG has brought the flexibility of rollable keyboards and the rigidity of foldable keyboards together in its Rolly Keyboard (model KBB-700). Fashioned from impact-resistant polycarbonate and ABS plastic, the four rows of the Rolly’s keys are flexible, allowing them to roll around an elongated rectangular box that sits at the top of the keyboard when in use. This box houses two arms that fold out to support a smartphone or tablet, and the single AAA battery that powers the device for up to three months of average use. Unrolling the keyboard will activate the auto-pairing function to connect to a mobile device via Bluetooth 3.0. The Rolly can also be paired to two devices at once and switch between them with a single button press. Rolling up the keyboard powers it down and sees the keyboard form a “stick” that can be carried in a pocket or purse. Despite its portability, LG says the Rolly boasts a pitch, (the distance between the centers of two side-by-side keys), of 17 mm, which is close to the 18 mm pitch found on most desktop keyboards. 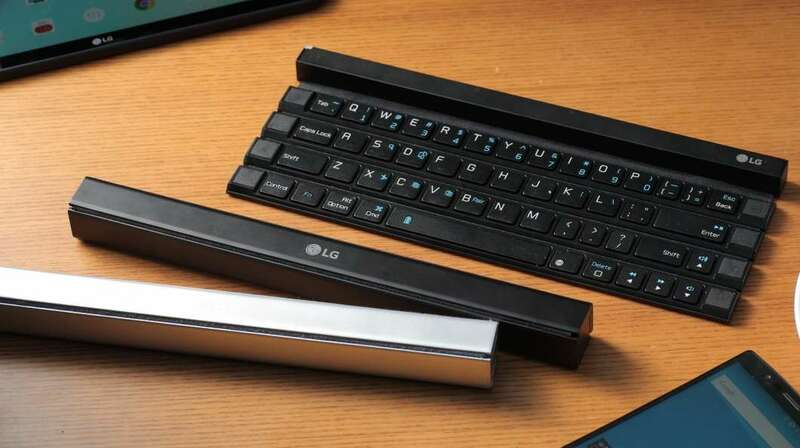 LG will unveil the Rolly Keyboard at IFA 2015 in September and says it is part of an effort to grab a greater slice of the mobile accessory market pie. The device will be released in the US next month, ahead of a fourth-quarter release in Europe, Latin America and Asia. Pricing details are yet to be announced. Sleep and activity monitors have a lot of advantages, but aesthetics often isn’t one of them. Many look like exactly what they are and even ones that are incorporated discretely in watches aren’t very popular with people who don’t want to wear watches in bed. Billed as the “world’s first wellness ring,” the Ōura ring takes a sleep and activity monitor and hides it inside a piece of finger jewelry that makes the technology unobtrusive and unself-conscious. The Ōura ring was developed by Finnish industrial designer Harri Koskinen and Ōura co-founder and CTO Kari Kivelä, and is based on three decades of R&D by Finnish wellness technology companies. Its purpose is to monitor sleep balance, activity, relaxation, and recovery using a stand-alone computer that performs functions previously requiring separate devices. The Ōura ring itself is made of a zirconium ceramic that the company says is waterproof and harder than steel, yet comfortable to wear. It incorporates a laboratory-level sleep monitor, activity tracker, and heart rate monitor, as well as medical-grade pulse-oximeters to measure blood-volume pulse. It has an internal battery that charges in 30 to 60 minutes and runs about three days. The ring’s presentation box also acts as a charger. The Ōura ring communicates with an Android or iOS app, however it does not require the presence of a smartphone to operate. Instead, the ring has a memory buffer and downloads to the phone when it’s nearby. The app provides day and night readouts of heart rate, brain activity and body temperature, as well as advice on how to improve sleep and performance. 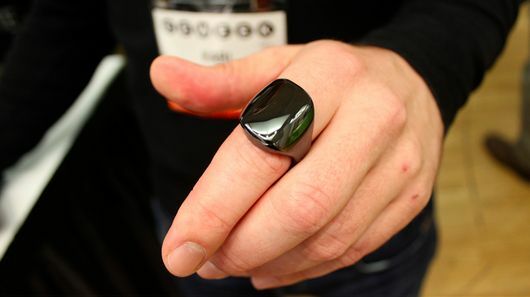 The Ōura ring will be available for US$250 in US sizes 6 to 13, and a choice of white, gloss black, and matte black. Preorders begin at the end of July or beginning of August with delivery scheduled for October. Can Wearable Tech Measure Our Stress And Calm Us Down? A growing number of devices are trying to gauge when we’re freaking out. But as the latest entry into the market shows, that’s a harder task than we think. Part of the premise behind a new wearable called WellBe is pretty depressing: Many of us are so continuously stressed out—or so disconnected from our feelings—that we can’t actually tell which parts of our day are making us most anxious. So the WellBe, now on Indiegogo, was designed to make those feelings a little more obvious. In theory, if you slap on the new wristband and sync it up with your calendar, it will tell you who and what is stressing you out most each day. Then it gives a series of simple meditations and exercises to help you better deal with those situations. “We believe that when you know the triggers and have the solution, this is how you really reduce stress,” says Doron Libshtein, chairman and co-founder of WellBe. One problem, however, is that it’s not yet clear that the wearable can accurately measure stress. The WellBe is designed to track heart rate variability, which can correlate with how upset you are, and it uses a custom algorithm to analyze changes in heart rhythm. But heart rate variability is notoriously difficult to measure—especially through a gadget like a simple wristband. The WellBe only works when someone is sitting down, as an attempt to improve accuracy. (That in itself is a drawback—as someone who walks and bikes, I’m pretty sure some of the most stressful parts of my day are when I’m trying to avoid being run over by cars). But even small movements can ruin data. An algorithm that works for one person might not work for another, she adds. And even if the device can accurately track heart rate variability, that doesn’t automatically mean that it knows how you feel—someone who’s excited and happy, for example, might have similar patterns to someone who’s freaking out about a missed deadline. “It’s really tough to use heart rate variability as a measure of stress, because you can’t really disentangle the different emotions,” says Simon. It’s also not the case that people are typically either “stressed” or “relaxed”—instead, our bodies are usually in complex state of both at the same time, making stress even harder to measure. Other wearable startups try to measure stress in different ways, like Spire, a gadget that tracks breathing patterns instead of your heart or the Neumitra, which measures electrical properties of the skin as a proxy for brain health. These methods, too, can be prone to error. For example, the temperature and humidity of the room and the medication someone is taking could skew the Neumitra’s results. Though WellBe plans to do an independent study, it’s not clear yet that their algorithm can solve the device’s challenges. It also only gathers data for three minutes each hour, so it isn’t clear how it can necessarily catch each stress trigger. It’s possible that the app might work better if it just asked people to rate their own stress—and then offered the same relaxation techniques. 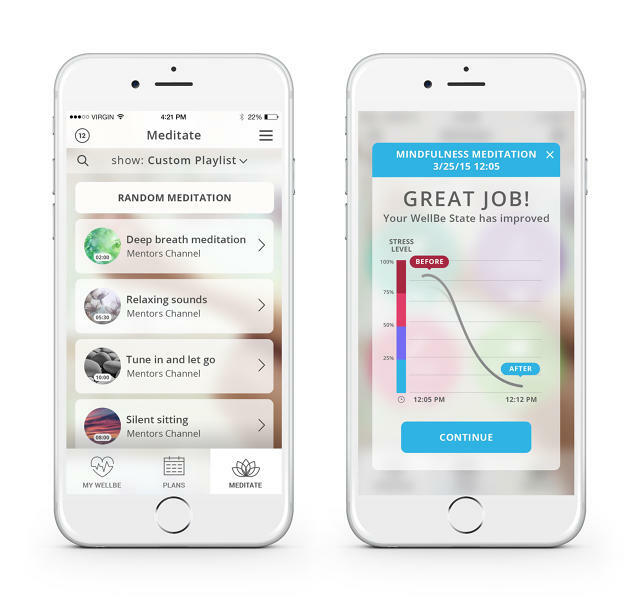 Still, the rest of the app seems like it could be useful: The company offers a library of over 1,000 different meditations and other relaxation techniques, and the app tries to quickly learn which methods work best for each person. The lesson is that there’s no one magical way to measure stress, though it may be more possible with more streams of data. Anyway, for some people, it may not even be desirable. Stress is often a side effect of actual work getting done. Posted on June 5, 2015 Categories InnovationTags gadgets, Wearables2 Comments on Can Wearable Tech Measure Our Stress And Calm Us Down? We’ve seen a number of ideas for making Bluetooth portable keyboards that are compact yet still not frustratingly tiny – these have included devices that project virtual keys, devices that fold, and that can be rolled up. The Moky keyboard, however, takes a different approach. It saves space by allowing its keyboard area to double as a multi-touch trackpad. According to the Seoul-based Moky company, the device uses “infrared laser sensors” to overlay an invisible trackpad on top of the keyboard. It lets users perform actions such as clicking/dragging, scrolling, swiping, pinching in and zooming out, simply by making the traditional finger movements directly above the keys. While it isn’t clear exactly how the system works, the principle appears to be the same as that used by Continental’s “infrared curtain” technology for multi-touch displays in cars. In that case, a raised rectangular frame around the display has a series of LEDs along two adjacent sides, and a series of photodiodes along the other two. Each LED emits a beam of infrared light, which is picked up and converted into an electrical signal by the photodiode located in the corresponding spot on the opposite side of the frame. When the user reaches through the grid of infrared light beams in a given location, their finger blocks some of the beams. Those beams’ photodiodes temporarily stop receiving light, and thus cease sending a signal. By analyzing the combination of affected photodiodes, the system can determine the location of the user’s finger relative to what’s being displayed on the screen, in real time. Some of Moky’s other features include pantograph (i.e: individually spring-loaded) keys, an aluminum body, a folding cover that also serves as a smartphone/tablet stand, and a rechargeable battery that should be good for a claimed three months of use per charge (based on about four hours of use per day). The keyboard utilizes Bluetooth LE, and is compatible with iOS, Android and Windows devices. Moky is currently the subject of an Indiegogo crowdfunding campaign, where a pledge of US$69 will currently get you one – when and if the keyboard reaches production. You can see it in use, in the pitch video below. And although Moky may end up being the first true keyboard/trackpad hybrid to make it to market, this certainly isn’t the first time that the concept has been conceived of. Microsoft Research’s prototype Type-Hover-Swipe keyboard uses an array of infrared proximity sensors located between the keys to achieve the same ends, while Apple’s patent for the Fusion keyboard incorporates touch sensors in the surface of the keys. There are two types of people who will likely be interested in Magicubie’s iMbrief (pronounced “I’m brief”) briefcase: those in high-powered, fast-moving, security-sensitive jobs and those who want to pretend they’re a spy. Its host of features will surely satisfy either camp. The iMbrief is designed to function as a mobile office and is aimed at being fashionable, secure and versatile. First thing’s first, of course, it provides users with a means of storing and transporting documents securely, with an LED light inside to illuminate the contents. Access to the iMbrief is via a fingerprint scanner or the accompanying mobile app, which is available for both iOS and Android and connects to the case via Bluetooth. It has a Kensington lock slot (those chunky locks often used to secure electronic devices in shops and offices), allowing it to be secured at a location, and siren to warn users of any unauthorized access attempts and to try and scare off any would be thieves. The iMbrief also has an SD card slot for internal data storage. This can be used to save, store and share digital files and its capacity checked using the mobile app. A Wi-Fi SD card provided with the bag allows data to be accessed wirelessly, making it quick and simple to transfer files. Mobile devices can be charged both internally and externally using the in-built 5,000 mAh primary battery. The iMbrief has four USB charging ports in total – two on its exterior and two in the inside compartment. An optional and removable 18,000 mAh second battery can also be used to provide additional power for devices. A GPS sensor allows the location of the iMbrief to be tracked. This means it can be located if lost or stolen. Location is also recorded to create a historical map of the bag’s whereabouts, allowing a user to retrace a journey if needs be. The iMbrief can be use to play music via its built-in Bluetooth speakers. The speakers are also used to provide reminders of calendar appointments, which can be set using the mobile app. The speaker is used as the security siren as well. The case is charged via a USB port and takes around two hours for a full charge of the 5,000 mAh primary battery. A full charge can apparently last for over a month if only the fingerprint scanner is being used, but if it runs out of power, it must be charged before it can be opened again. 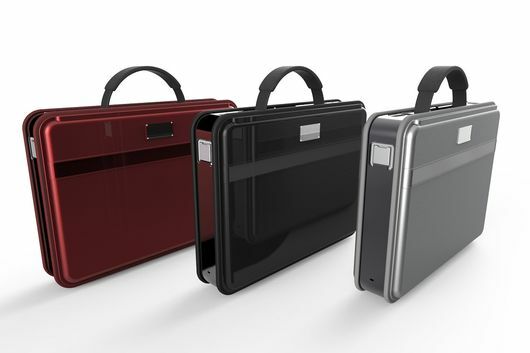 The briefcase has an aluminum-alloy shell and is will be offered in grey, black and burgundy if it reaches the market. It weighs around 4 lb (1.8 kg) and measures 450 x 330 x 95 mm (17.7 x 13 x 3.7 in). It is available with a detachable shoulder strap. An Indiegogo crowdfunding campaign is underway for the iMbrief. At the time of writing, individuals who pledge from US$299 in support can receive one of the briefcases, assuming all goes to plan with the campaign and roll-out. Shipping is expected from January 2016. The video below is the Indiegogo pitch for the iMbrief. If you’re like a lot of phone junkies and replace your phone as soon as the latest thing comes along, you’ll know that often the hardware in the old phone is perfectly fine, even the battery. But fancier new screens and more powerful processors mean that battery life usually remains a problem, making battery packs a popular accessory. 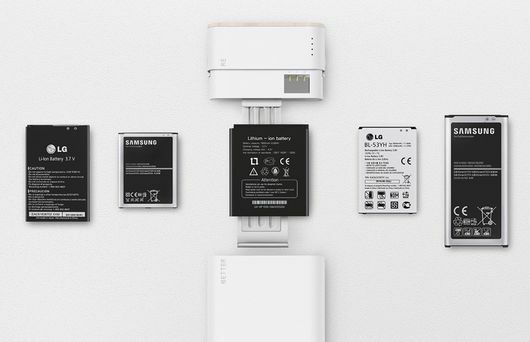 Enlighten’s Better Re lets you get some more use out of your old phone’s battery, by allowing it to slot into an adjustable external battery charger for your new phone. Enlightened has already received awards for the design of its “upcycling power pack”, which it is now seeking to fund through Kickstarter. The idea is simple: create a case to house an old cellphone battery and create a sleek external charger. Go crazy and stack multiple expansion packs connected via magnet to provide even more charge capacity. The case adjusts to accommodate batteries of sizes up to 58.5 x 97.8 x 6.5 mm, which Enlighten says is the biggest battery currently on the market. Enlighten argues that the average turnover of a cellphone is 1.3 years, while after two years of use, a battery is still around 80 percent efficient. Additionally, many mobile phone users who have a phone with a removable battery buy extra batteries to ensure they aren’t caught short. While reports from Recon Analytics in February 2015 suggest that mobile phone turnover rates are slowing, from 22.4 months in 2013 to an anticipated 28.4 months this year, there are still a lot of extra batteries out there. How much charge you could get off a Better Re will of course depend on the capacity and condition of your old battery (for example, a Galaxy Note battery is 2,500 mAH), as well as what rate your current phone can charge at. With an output of 5 V and 2 A, the company says the Better Re should charge an iPhone 6, with its 1,810 mAh battery, in just under 55 minutes, while an iPad Air 2 and its 7,340 mAh battery will take just over 220 minutes. A Galaxy S6 (2,550 mAh) and Galaxy Note 4 (3,220 mAh) should take 76 and 96 minutes, respectively. If you don’t use phones with removable batteries such as iPhones, Samsung Galaxy models, an LG3, or a Note, Enlighten has a pledge package that includes a recycled phone battery. It also plans to produce batteries of its own. The Kickstarter campaign offers the Better Re for a US$39 pledge, with an additional $20 for an expansion case. If everything goes to plan, delivery is estimated for November 2015. Enlightened’s video pitch for the Better Re can be viewed below.